While snoring can be annoying for family members trying to enjoy a night’s rest, it’s more than just a nuisance. It can also be associated with a more serious condition called sleep apnea. Those with sleep apnea experience irregular breathing during sleep. 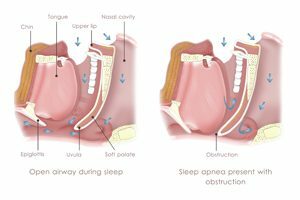 The most common type (called Obstructive Sleep Apnea) occurs due to snoring, when the tongue and soft tissue relaxes and temporarily blocks the air passage. This pause in breathing causes the brain to repeatedly wake from deep sleep, depriving you of the rest you need. Those with sleep apnea may not even realize they have the condition, but often wake feeling especially tired—even after having a full night’s sleep. The lack of restful sleep can also lead to other conditions such as irritability, stress, weight gain, high blood pressure, insomnia, and hypersomnia. You might not think of snoring as a something a dentist can help treat, but we can! Often times, a nightguard or other dental appliance can be simple fix. We take a mold of your mouth to create the device, and it works by simply keeping the lower jaw resting in a slightly more forward position. This prevents the tongue from blocking the airway and helps you get the restful sleep you’re looking for! Contact us about custom nightguards, mouthguards, and other dental appliances to treat sleep apnea.